So I had this blue teardrop appear randomly on my s7 edge screen, about halfway down the screen on the right edge, about 1\2 inch in. Teardrop is about a ¹\⁴inch across. 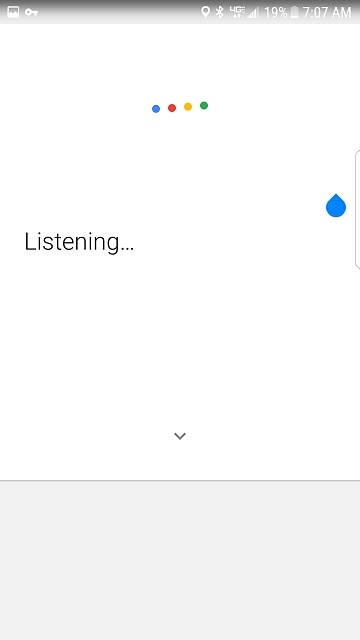 No matter what app I open or what page I'm on, the blue drop is still there . Anybody ever seen this? Welcome to Android Central! What happens if you tap it or press and hold it? I see a little tab to the right of it, so it looks like you can expand something -- try dragging that dot to the left. A weather alert from the edge apps? 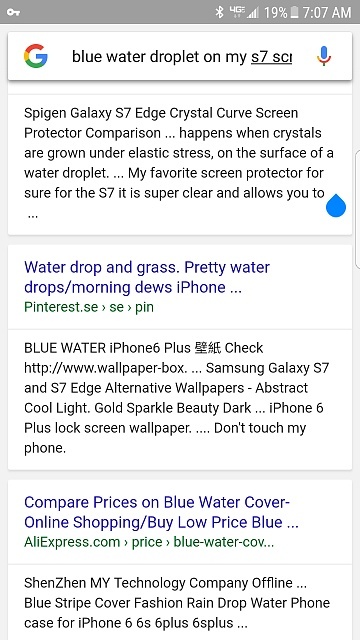 The tab ur seeing to the side of the droplet is the S7 edge menu. Nothing happens when I click it, can't drag it either. If I rotate my screen however it does move closer to the middle. Other than that it won't move or do anything. Not that I can tell, I don't have my weather alerts on , and I've gone through the edge stuff pretty thoroughly. It's possible I missed something, I will check again. Thanks for responding. This is one of those things that has been posted elsewhere and the answer has not been found. If any of you find out what it is please comeback and post it here. Thanks! Mine just disappeared ....There's got to be an explanation . Seems like a glitch. That icon is the keyboard text cursor. You probably find that you have selected a text box in a certain app and it isn't clearing when you close the app. Or that app could be drawing over the top of other apps. Does it go away after you clear your recents? If you open your keyboard and close​ it again, is it gone? WalkingHorse, B. Diddy, MetalKore and 1 others like this. Agree with beagle82. That icon shows up (although it usually is tilted a bit). If this was happening to me I would wipe the cache partition to see if that helps. If that doesn't help I would temporarily select another keyboard then reboot my phone. Then I would select my preferred keyboard and reboot again. B. Diddy, MetalKore and Mytandroidblogger like this. Yes, it's removable. It's a blue GPS raindrop/teardrop trying to locate your current location for an app (lication). 1. Go to home screen and TAP bottom right (APPS), and proceed to SETTINGS. 4. TAP LOCATION [9th option] OFF (Just momentarily) while still in Connections via SETTINGS. 6. Last go into Settings, DEVICE MANAGEMENT and FIX ALL that is needed or where you see a number. Once your device is at 90% or higher, BEST @ 100%, THE GPS RAINDROP/TEARDROP IS GONE. ALL APPS Notifications ON (Pushable). I would have thought that the GPS icon would point the opposite way (i.e., the round part at the top and the point at the bottom, like the Google Maps location icon). I've had this. It happens when you use a non standard (eg emoji) keyboard in a messenger app with a floating notification - the Facebook Messenger App in my case. If you use that keyboard having accessed the message group from the floating notification, and then close down the floating notification, you sometimes get a little blue teardrop! To fix it just reopen the App from its standard icon on the phone's homescreen and you should find it disappears! B. Diddy, LineKill, Sean Fanelli and 1 others like this. This is exactly right. I googled what was wrong as this thread came up. Follwed these inductions Abe closed all recent apps. When I closed my Facebook messenger app it went away. If you close out or drag down from top and "clear all" the blue teardrop will go away...works for me. If that doesn't work try force stopping and clearing the cache of other applications, I find the two most common apps that cause issues are Snapchat and Messenger, I have fixed this issue multiple times using this process, as even rebooting the phone (first troubleshooting step) often doesn't work for this particular issue. To get rid of the blue teardrop just restart your phone. That got rid of it for me. I have the same problem and i just noticed it. I try holding on it and drag it, but nope it won't let me move it.. sigh. Please, help me fix this problem soon. Thank you much. Why does my phone have headphone on it if theres not even headphones?